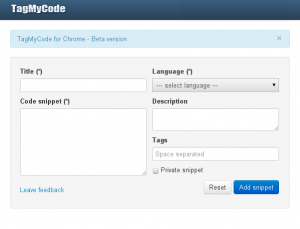 We are exited to announce the first beta version of the official Google Chrome extension for TagMyCode. This tool allows you to save your snippets in a fast and easy way on Google Chrome browser. You can also add extra informations such as description or tags and then your snippet is stored in a few seconds. Try it now and please leave us your suggestions or report a bug. I’d like to see code highlighting for R and/or S-PLUS (statistical software languages). Even if this is slanted towards web programming, these are relevant because they’re used in the analysis of ‘big data’ – precisely the application I’m using R for. vim has an R highlight scheme, fyi (for reference).